Your ultimate cleaning satisfaction is within reach! However, it is important to educate yourself on which central vacuum installation is right for your home, and one of our local dealers can help as well. You have three installation options, along with supplementary accessories that will enhance the system. These affordable installations are applicable for newly constructed or existing homes and take a day to install, with no damage or mess. £900-£2200* For new home construction, four inlets, products, and labor. Existing home installation may cost several hundred dollars more. 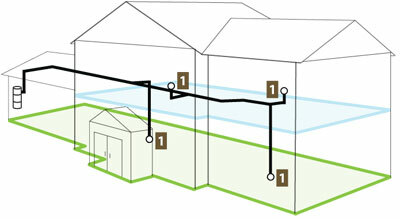 Inlet valves cover all areas using a 30-foot plug-in hose. Traditional inlet valves recieve a traditional-style vacuum hose. Electric carpet brush can be used for deep cleaning. Small inlet footprint on wall. Can use any number of universal hoses. Multiple inlet locations to carry hose to. £1900 – £3100* For new home construction, two inlets, products, and labor. 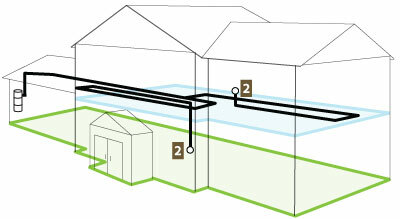 Existing home installation may cost several hundred dollars more. 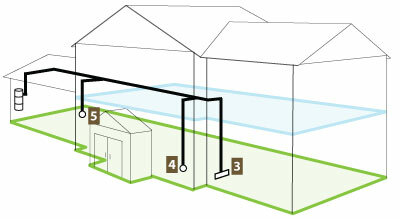 Hide-A-Hose Inlets or Retraflex cover all areas using an integrated 50-foot retractable hose. The hose is pulled out from the wall inlet where it is stored. Eliminates problems associated with traditional hoses. Pull out any length and instantly retract hose when finished. Hose length available in 30, 40, 50, and 60-feet increments. Cannot use an electric vacuum brush for carpet. £1900 – £2400* For new home construction, three inlets, products, and labor. Existing home installation may cost several hundred dollars more. Inlet valves for a traditional-style hose that covers second story, and an inlet valve with a 50-foot retractable hose that covers first story. Retractable hose for hard floor surfaces and area rugs. Traditional inlets for electric vacuum brush for carpeting. Best of both worlds – deepest carpet cleaning and ease-of-use. 30-foot hose storage and management. Two tool sets needed: electric upstairs, non-electric downstairs. and watch the dirt disappear into the vacuum system. quick clean-ups using the hose that stretches from 7 to 28 feet. WallyFlex. Auxiliary hose that mounts on wall and stretches 14 feet. Great for the pantry, laundry, garage, or bathroom. Installation Notes: The pipe layout is basically a trunk line that branches out to inlet locations via the basement, attic, soffits, and hidden spaces in the home. The length of the pipe and the number of stories is not a problem for the suction of a central vacuum. A traditional inlet with a 30-foot plug-in hose will cover 700-1000 square feet, and a 50-foot retractable Hide-a-Hose will cover around 2300 square feet. 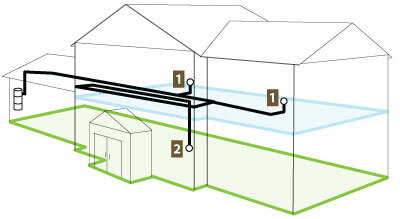 Either central vacuum system can be installed in new construction and existing construction homes. Homes that already have a central vacuum can be updated with a new vacuum unit, including accessories and products such as Hide-a-Hose, VacPan, and WallyFlex. *The goal of these price ranges is to show central vacuums are affordable. Price range is for an average 1800-3000 square foot home located in a middle class area. Prices are set by independent local installation companies and each job will have factors that influence pricing. Read the Installation Frequently Asked Questions. Detailed central vacuum installation manuals, whether you hire a central vacuum installer or do-it-yourself.